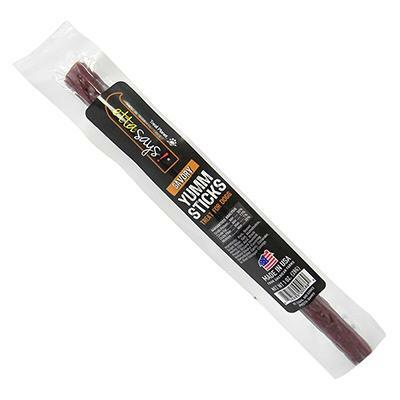 Etta Says Yumm Sticks are quick and convenient individually wrapped treat stick for dogs. Each one ounce stick measures about 8 x .25-inches and is sure to make your dog happy. Made in the USA with ingredients sourced from US farms. Savory pork and brown sugar flavor! Pork, brown sugar, water, salt, maltodextrin, honey, citric acid, black pepper, ground mustard, natural smoke flavoring, dehydrated garlic, coriander, beef collagen casing.